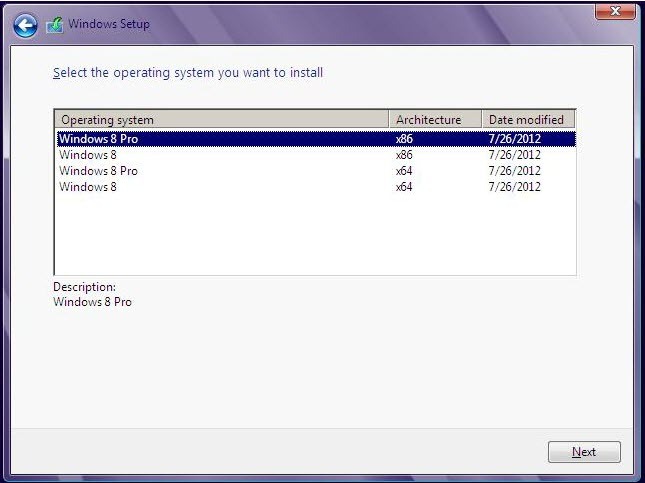 I noticed that the ISO for Windows 8 Pro RTM doesn't have the familiar ei.cfg file that Windows 7 SKUs had. In Windows 7, you could edit or remove this file and then you would be able to install whichever SKU version you wished. But I can't find any such file in the Windows 8 RTM ISO. Anyone else found this to be the case also? Professional doesn't, but it's also possible the unofficial ISO's don't have it but the MS released ones will. So, you're thinking the official releases tomorrow on Technet and MSDN will have it? I guess I was figuring that the leaked builds are exactly what are coming out officially. Dunno, we will just have to wait and see. Yes I noticed that too and was concerned as to how one would go about "unlocking" all SKUs like in Windows 7 where simply removing the ei.cfg would do it. So looking over another all-in-one download that did unlock several SKUs I noticed that a ei.cfg that was created that essentially did the same thing. I've tried it and it works to unlock the SKUs. Just create the file with notepad and add it to the \sources directory (where it was in win 7) and you will get the result below. The ei.cfg file I used is shown below. You can also make an all-in-one disk that this attached graphic is from by following easy instructions here (this is for win 7 but it adapts easily and works the same for win8 (I've tested! ): http://www.techpower...ad.php?t=145356 By the way, using this ei.cfg file also had the effect of giving the menu instead of having to enter a key. You can therefore install without a key--it does ask for a key at the end (instead of the beginning) of the install but, also, using this file gives you a "skip" option at that point! Of course you'll need something eventually to activate. Brilliant! Thank you! Of course, I'll be installing just the Pro version, since I really don't see the need for the additional stuff that comes with the Ultimate version. Unless, of course, Ultimate has features that I would find useful. no Ultimate--just "home" called Windows 8 (also called the 'core' version) and Windows 8 Pro. They went from 5 versions back to 2, like in XP. There's also Enterprise and Server 2012, like there was with 7, and a new WinRT that is just for tablets. There is no Windows 8 Ultimate. Terrible bad info there. No "home", no "Core". Ah OK. Well, makes sense. It was best with XP; XP Home and Professional. Especially since with Windows 7 the Ultimate version came only with BitLocker drive encryption and free language pack addons. These are "familiar" names that have been used by many to describe what is technically named "Windows 8." I wasn't giving the version those names per se. There are tonnes of version names floating about that people are inventing so I dont blame you for giving out advice on windows 8 home/ultimate or whatever. There are four SKU's for Windows 8, but not quite named as above. Care to elaborate on my mistake?